Hanging wedding cakes have been popular in the USA for a couple of years now and when I was first asked to make one I wasn't even sure what a hanging cake was. After some research and finding some amazing pictures of hanging cakes I realised that this was the future for wedding cakes for those couples who wanted something different. It took a considerable amount of time to source an appropriate stand. It had to look pretty, be able to carry the weight of a 4 tier cake, small enough to stand on a table but tall enough to hang the cake from and most importantly, be stable. The stand I have exceeds the criteria. The cake can be seperated as in the picture or it can be stacked and the design can be adapted to your wedding theme and colours. If you choose a 3 tier stacked hanging cake why not hire the water fountain as well for an etra special cake. If you would like a hanging wedding cake please contact us. 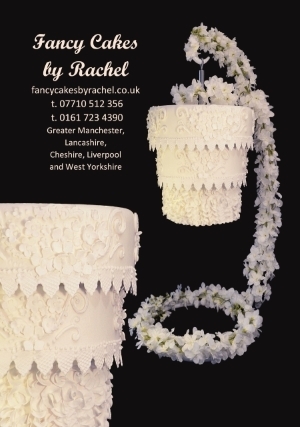 We believe we are the only company in the North West making hanging cakes.